I thought I'd seen it all. 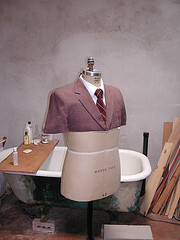 But then a friend of mine told me about a unique "half-suit" called the Businessbib created by Tucson-based designers Brad Denboer and Jeff Adkins. Their company, Klosk, operates under the philosophy that many everyday "objects can be re-invented." If you're looking for a special something for a friend or family member who enjoys being a talking head during videoconferences, this just might be the perfect gift! According to the designers, "the Businessbib allows you to look perfectly put-together in a fraction of the time it takes to boot your computer. You can work from home in your underwear while presenting a polished appearance to the people that matter most. Using a simple abbreviated design of the traditional business suit eliminates the time and effort that goes into primping for more formal meetings. It frees your time and allows you to continue uninterrupted with your casual lifestyle. In a word, the Businessbib is a halfsuit. Each sturdily stitched ensemble is stylishly appointed and hand made from recycled materials. No two Businessbibs are the same. In fact, each one is christened with it’s own name based on it’s overall aesthetic. With its split back Velcro-sealed design, the short-sleeved Businessbib can easily be worn and removed with comfort and ease. Just slip it on over your tee shirt and shorts- no one will ever be the wiser. Appearing to others in your video domain to be fully prepared for the business at hand with little to no preparation may soon be considered the most important freedom of all."